I see things and think, “Wow I’ve got to take a photo of that!” It’s all in the name of Visual Research. 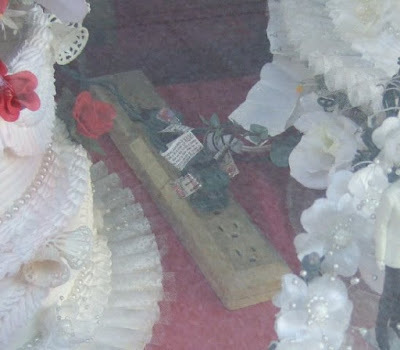 I spotted this Chinese wedding cake in a dusty shop window in Chicago. It is ticking a lot of boxes for me. It’s so OTT. There was not just one cake but five all joined by fantastic fairytale and “gloriously” iced bridges. It was Chinese but seemed to me western in a weird sort of American way? But most importantly it was the light fittings and extension lead that really “turned me on”. So it’s a lit up wedding cake! And with so many lights that it needs a multi socket extension lead. But the sockets seemed to be miniature. Like a caravan or better still a dolls house. This is how my mind works; I’m making connections all the time. 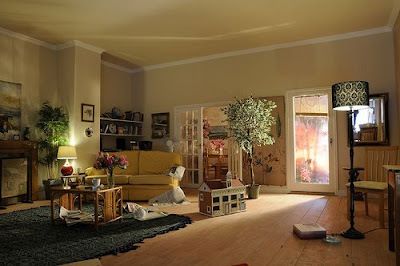 I loved my dolls house. It was handed down to me by my dad’s second cousin and it was old. Sadly when I was only about 5 my grandmother took it to a dolls house repairer. He stripped all the wiring out, well the lights didn’t work anyway and they must have thought that I wouldn’t notice or mind. But I did. I remembered and, believe it or not, I even dreamed of these lights working again. For me it’s so often about the tiny details. I even had a miniature dolls house within my dolls house. So when we visited Manfredi Beniati’s fantastic installation as part of Liverpool Biennial MADE one of the best details for me was that he had made a dolls house within his staged perfect house.We knew that we were looking for a hole in a scruffy billboard on Renwick street but it wasn’t until my second visit that I noticed the other details. One of the posters on the peeling billboard is actually a photograph of his dream installation. In the photograph there is a boy with a hammer in his hands and he is bashing at something. When you look inside through the viewing hole you see a hammer lying discarded on the carpet. This is the hammer that the boy was using. The hole that you are looking through is actually the hole that he has made; the one he was making in the photograph. Honestly, it look me two visits before I put all this together. I love mind twists like this. Theatre, make believe and a twist on reality. It’s fantastic. My only excuse for not getting this all on first viewing was that I was so entranced by the dolls house that Beninati had made and placed, meaningfully, in the middle of the room. It’s all about possibilities and these are within each viewer’s mind. Possibilities can have more power than physical reality. In my dreams of my dolls house the working lights were chandeliers not plastic dolls house fittings with clumsy switches. 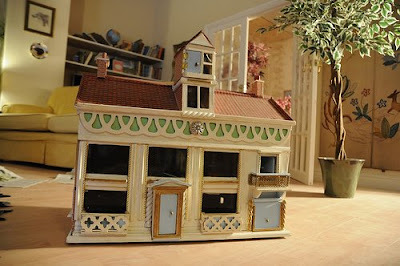 And here's the minature house from my dolls house. My second trip to Liverpool Biennial was with a group of other artists also part of Eastside Projects Extra Special People.